You're a celebrity to me! You haven't changed much since high school! Aw High School Lenore is too cute! Your hair looks so long!! gorgeous then and gorgeous now. You've hardly changed a bit! LOL- I agree with the consensus. You like like you are still in high school Miss Baby Face. My wife is the same way. She goes back to her hometown and people say she hasn't changed at all. She is past 40 and when she buys wine, she is still carded. Look at all the hair! Lenore, you still look the same. Gorgeous as ever! Love that picture. So cute! How brave! But other than the hair (which I loved! ), you do look very much the same! You were a hottie! haha. Must be why we have been friends for so long, haha. And I know Daniel and I have the same taste in 80's hair! Looks like you haven't aged much! And you'll be a celeb once Level 2 is released. I am jealous of how consistently pretty you are. Also, you are totes a celebrity...one that should include an Atlanta stop on her book tour. Looks like the beginning of a blogfest to me. Wow! You haven't changed a bit! Gorgeous then and now! You're so pretty, both in high school and now! I think you're a celebrity!! I tell everyone that I know a published author!! BTW...I preordered your book the other day and it was so very cool just knowing that I will be reading it soon!! you haven't changed at all...other than being more grown up! Love you! Ah! You are so gorgeous in both your pictures! There are some school photos of mine that should *never* see the light of day. Super super fun. And isn't it amazing how many similarities you can see in these types of side by side comparisons? 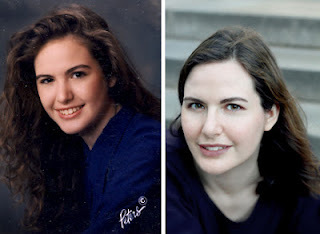 Okay, your high school photo looks far better than ANY of mine ever did!